Early on the first half Ingolstadt shows teeth and the will to achieve an early opener. On 2’ a corner kick and Kittel finds the ball. No threat for Himmelmann though who secures it easily. On 9’ the first big shot of the game belonged to Ingolstadt again and in particular Otavio . Shoots hard from distance but Himmelmann is there once again and sends the ball to a corner. Corner gone to waste by Ingolstadt and moving on. Both teams seek for breaks in each other’s defense but the action mostly stayed in the midline. We looked kind of dazed and stunned and had to wait until 33’ for a proper attempt on our behalf. Buballa attacks from Tschauner’s right and shoots a distant shot. The ball is sent way far from Tschauner’s left causing no threat to our former goalkeeper. No big deal and not our greatest moment but really our first decent attempt so far. That alone can give a pretty nice picture of the game play. A dull first half with both teams being stuck in their own mindset, not being able to unfold any strategy. On 37’ Sobota finds Möller Daehli who shoots but Tschauner blocks his shot to a corner. The corner executed by Knoll was blocked by Kittel. 7 minutes later, on 44’ the big chance for a score opener for Sankt Pauli. Sobota flanks and opens a nice ball for Meier. Meier’s header though is weak, ending directly to Tschauner’s hands. Final whistle for this first half on 45’. 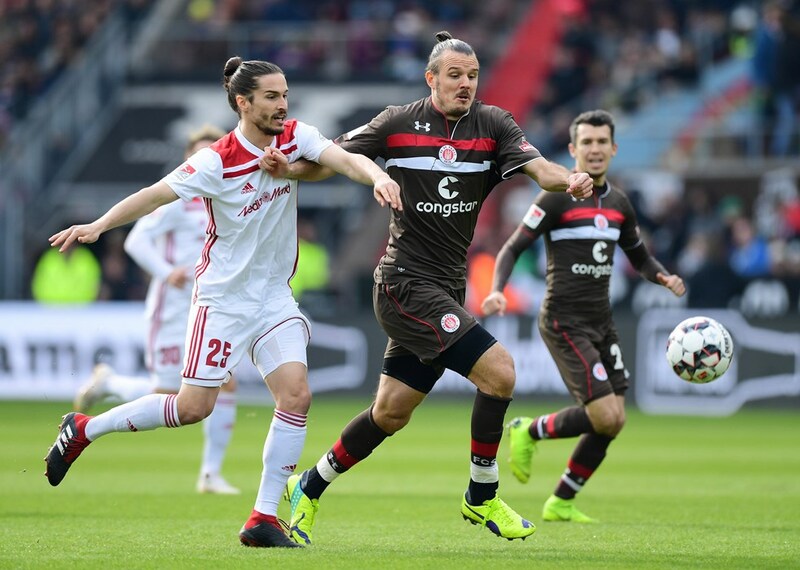 Second half underway and what we hope for, is to see FCSP get over this jam in communication of the first half and unfold a nice game play. On 51’ Tschauner on his attempt to send Knoll’s corner kick away, moves a bit more far from his nets than he should. Meier returns the ball in Ingolstadt’s box but it is headed out of the lines. Avevor is there returning it to whoever is there. The receiver luckily is Hoogma who shoots but the ball ends up in Tschauner ’s arms. Good moment there proving that we were back to see these three points in our pocket. What didn’t happen on 51’, took place on 54’. A foul for Sankt Pauli, executed quickly by Knoll, catches Ingolstadt off-guard. Buballa receives and opens for Meier who was standing in front of Tschauner. Meier does what he knows best and opens the score for Sankt Pauli. The momentum was great and we kept on hammering Ingolstadt’s defense for a while. On 69’, Sobota with the ball passes on to Möller Daehli. He opens for Zehir who shoots but his shot is blocked. Same luck had his rebound shot, as the ball ended up on his feet. 2 minutes later Ingolstadt tries to react with Kittel. His shot though although well executed, ends up way above Himmelmann’s upper post. On 81’ Ingolstadt earns a corner. Krauße goes for the header but can’t find target and sends it far from Himmelmann’s right post. Sankt Pauli just barricaded to the back leaving Ingolstadt wear out themselves on futile attempts. On 89’ another lost header by Kotzke . No chance for Ingolstadt to take the game. It was obvious and this translated in nervous attempts on bringing the ball to our box. On 90’+1 a mini siege leads to nothing for them. Röcher in an attempt of bringing the ball back to our box, uses his hand. Second yellow for Ingolstadt’s offensive and a red card sending him to the bench. 2 minutes later Schneider almost doubles the goals for Sankt Pauli. If only he had a better aim. Counter attack for Sankt Pauli and the clock shows 90’+3. Tschauner is far from his nets and Schneider attempts the lobe. Sends it a bit away from Tschauner’s left post. One minute later the ref whistles for the last time in this game. Hallelujah man. One way or another, we needed to win this. A nice three pointer to change the series of bad results. We did not play better than the previous games if we have to be dead honest. We just had luck on our side as there were many moments where Ingolstadt could have evened the score. No harm done though. No exaggerations in celebrating this one needed. We still have many aspects of our gameplay we need to work on. Next game on Saturday against Paderborn is not gonna be an easy one either. Nothing is yet finished and the second season has just started. Heads up and hard work is all that’s needed right now. FORZA SANKT PAULI.